Although most daily computer users have given up desktop computers in favor of laptops, laptops do still take up a bit of space. In a truly tiny living space, it helps to get rid of everything that takes up extra room, including your little laptop. 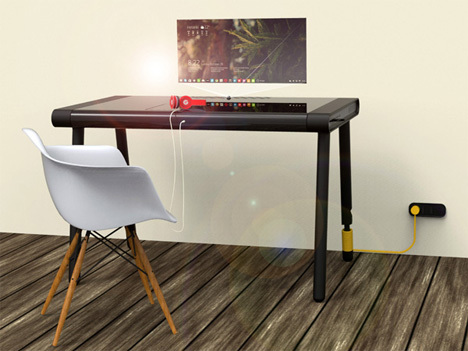 Designer Nithin Antony designed a table that also happens to double as a computer. The C-Walker is a self-contained sleek computer/table that features a virtual keyboard and a screen that projects onto the wall behind it. One side of the table discreetly contains the power button, CD drive, USB ports, heat vent, and Firewire port (which we suppose is included just to cover all of the bases since this doesn’t seem to be an Apple-branded concept). When switched off, the C-Walker looks like an unassuming black table. The touch pad keyboard only appears when the unit is on and ready to be used. The ability to switch from a piece of furniture – a kitchen table or study spot, perhaps? – to electronic equipment is what would make the C-Walker a great small-space solution. Charging your tablet or cell phone or plugging in any other device is simpler with the C-Walker thanks to three integrated plug points on the back of the table. You don’t have to find additional sockets or reach down to the floor-level outlets to plug in your stuff because the plug points pull out and can slide horizontally along a channel to position them just where you need them. 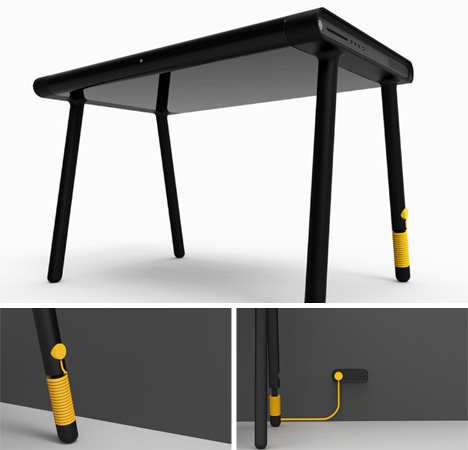 The entire table – additional plug points and all – is powered by a single plug extending from one of the table’s legs. When it isn’t plugged in, the cord wraps neatly around the leg and the plug fits neatly into a storage area on the leg. See more in Unbuilt Concepts or under Technology. June, 2014.